Privacy. While it’s the buzzword for 2019, it has always been a core part of the Mozilla mission, and continues to be a driving force in how we create features for Firefox right from the start. 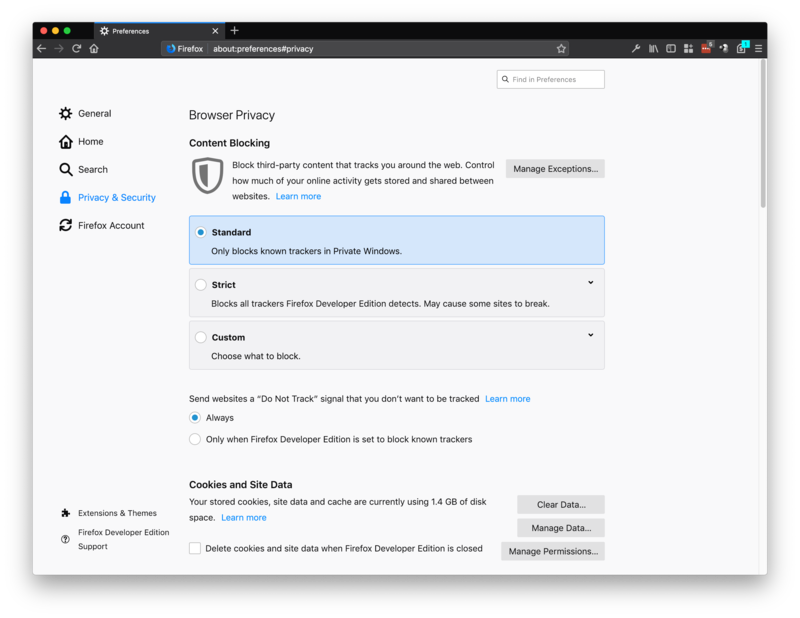 For example, last year at this time we had just announced Firefox Quantum with Opt-in Tracking Protection. We’ve always made privacy for our users a priority and we saw the appetite for more privacy-focused features that protect our users’ data and put them in control. So, we knew it was a no-brainer for us to meet this need. It’s one of the reasons we broadened our approach to anti-tracking. One of the features we outlined in our approach to anti-tracking was Enhanced Tracking Protection, otherwise known as “removing cross-site tracking”. We initially announced in October that we would roll out Enhanced Tracking Protection off-by-default. This was just one of the many steps we took to help prepare users when we turn this on by default this year. We continue to experiment and share our journey to ensure we balance these new preferences with the experiences our users want and expect. Before we roll this feature out by default, we plan to run a few more experiments and users can expect to hear more from us about it. Standard: For anyone who wants to “set it and forget it,” this is currently the default where we block known trackers in Private Browsing Mode. In the future, this setting will also block Third Party tracking cookies. Strict: For people who want a bit more protection and don’t mind if some sites break. This setting blocks known trackers by Firefox in all windows. Custom: For those who want complete control to pick and choose what trackers and cookies they want to block. 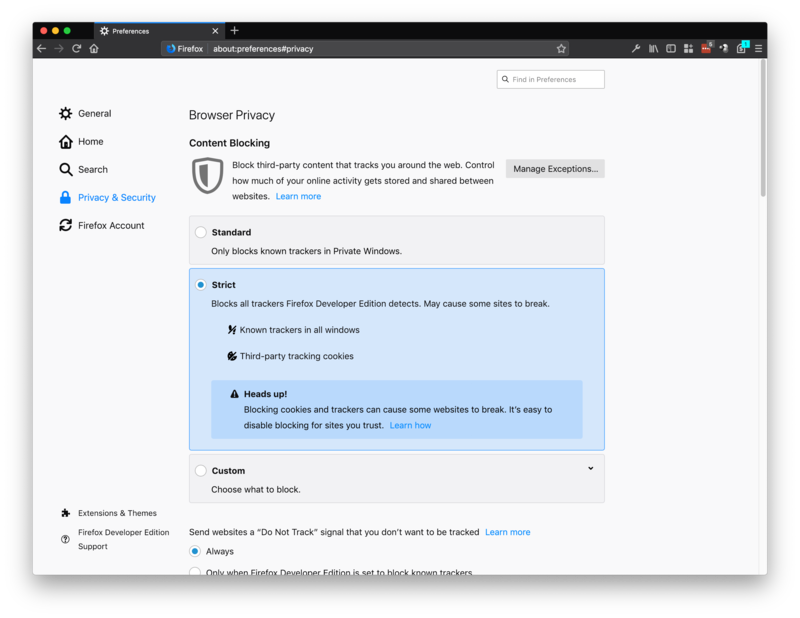 We talk more about tracking cookies here and about cross-site tracking on our Firefox Frontier blog post. 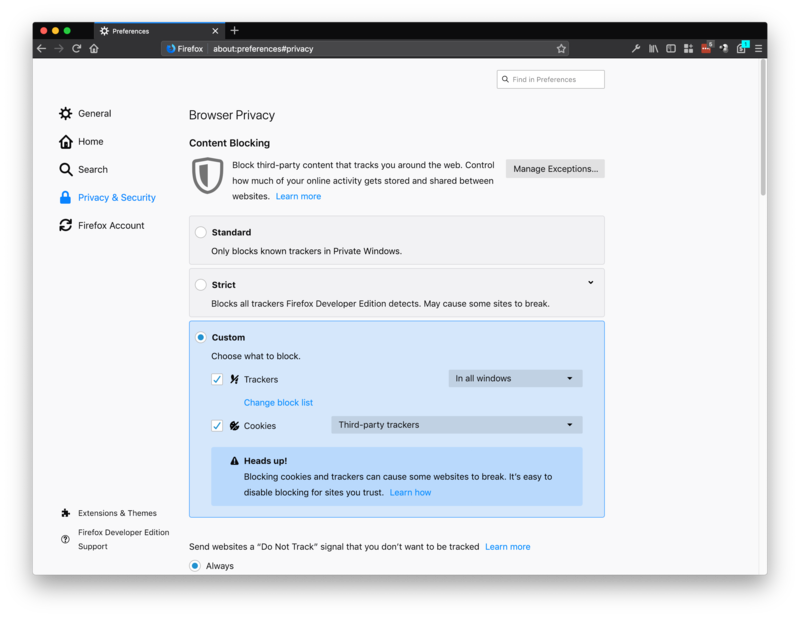 Trackers: You can choose to block in Private Windows or All Windows. You can also change your block list from two Disconnect lists: basic (recommended) or strict (blocks all known trackers). Cookies: You have the following four choices to block – Third-party trackers; Cookies from unvisited websites; All third-party cookies (may cause websites to break); and All cookies (will cause websites to break). AV1 Support – For Windows users, Firefox now supports the royalty-free video compression technology, AV1. Mozilla has contributed to this new open standard which keep high-quality video affordable for everyone. It can open up business opportunities, and remove barriers to entry for entrepreneurs, artists, and regular people. Updated Performance Management – For anyone who likes to look under the hood and find out why a specific web page is taking too long to load, you can check our revamped Task Manager page when you type about:performance in the address bar. It reports memory usage for tabs and add-ons. From there you can see what (tab, ads in tabs, extension, etc) could be the possible cause, and find a solution either by refreshing/closing the tab, blocking tab, or uninstall the extension. For the complete list of what’s new or what we’ve changed, you can check out today’s release notes.